Comfortable and calm house with a splendid view of the sea and the islands ( Brac and Hvar) . We offers unforgettable holiday, becouse house is placed in one of the most beautiful parts of the Adriatic coast. Small fishing village called Lokva Rogoznica/Ivasnjak , is situated between two main centres : SPLIT- 30 km away from us, ( Emperor Diocletian's palace, older than 1700 years, and Makarska . Villa is a new building decorated in modern style, with FOUR STARS **** . - The apartment ( 2+2 ) has 1 big bedroom ( double bad 160x200 cm), 1 bathroom ( bide and shower),equipped kitchen and big open space with quality sofa for 2 persons. Big own balcony with sea views, and outdoor furniture, air conditioned , SAT/TV., high speed internet and free parking. The apartment is equipped with a lot of imagination and a sense of good design. - STUDIO App. for 2 persons. 'Villa Puljic' is surrounded by grass and flowers, and Mediterranean herbs (rosemary, lavender, thyme, oregano, etc ..) and large flowered trees that provide natural shade on the balconies. Beautiful beaches are located within 200 meters from the villa., And provide a variety of options .....The offer local specialties is spectacular ... come and see for yourself .. In the bathroom are : sink, toilet, shower and bidet. Also our guests can use outdoor shower in the garden. Location: We are situated 25 km from Split , in direction from Split to Dubrovnik. 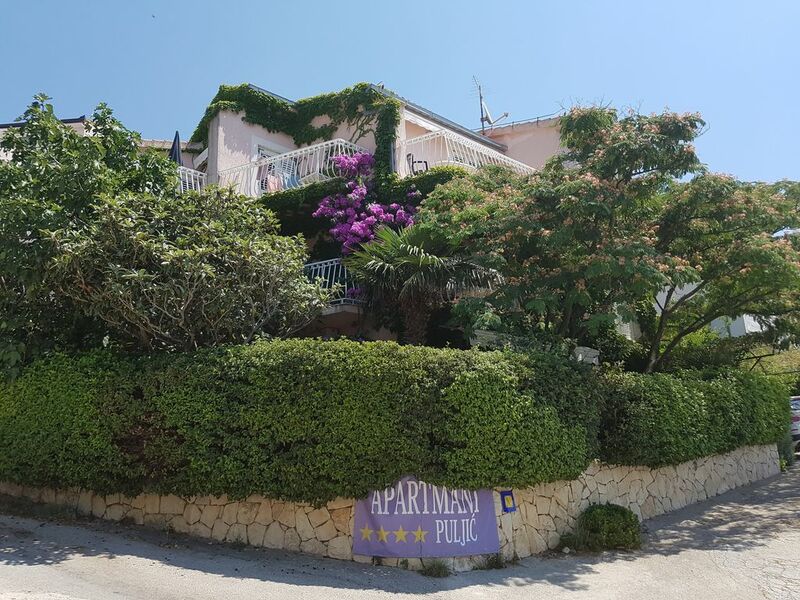 Villa is located between Split and Makarska (lots of bars and discos for night life), 10 km from old pirates city Omis in area full of small restaurants with domestic food, gallery... Also this area is famous of its beautiful beaches and nature. Not recommended for the elderly and disabled. These are the prices of accommodation in the apartment for 2-4 people, a down are prices for a studio apartment for 2 people. ---------------------------------------------------------------------------------------------------------------------------------- DOWN ARE PRICES FOR AN STUDIO APARMENT FOR 2 PERSONS : --------------------------------------------------------------------------------------------- MAY / JUNE : € 280 / per 1 week JULY : € 350/ per 1 week AUGUST : € 420 / per 1 week SEPTEMBER: € 280 / per 1 week Studio apartment for two persons (30 m2), has a private balcony with sea view, Sat / TV, air conditioning, high speed internet and parking. x. The reservations becomes valid when 30% of the amount is deposited on our account.